Cardio-oncology is the intersection of heart conditions in cancer patients, an emerging field with immense potential to improve cancer survivors’ quality of life. Cancer and heart disease are the two most common disease conditions and the leading causes of death. Chemotherapy is more effective than ever at treating cancer, but has a price. A third of cancer survivors will die of heart disease within 7 years. The aims of our research program are to improve these poor outcomes through early detection of heart disease, which requires enhanced diagnostic modalities, and by coordinating oncology and cardiology to enhance patient care. Establishment of dedicated clinical heart failure program to improve outcomes in heart failure patients. Aortic stenosis, or progressive narrowing of the aortic valve, is the most common form of valvular heart disease and affects 2‐7% of all people over 65 years of age, with early aortic valve thickening (aortic sclerosis) occurring in about 25% of these people. No medical therapies have been successful in reducing progression of aortic stenosis and the only treatment option is surgical. We have studied mechanisms and progression of early aortic stenosis and demonstrated that some common medications used for treatment of blood pressure and heart failure may be effective in reducing progression of aortic stenosis. We now are studying in more detail the therapeutic potential of these and related medications with an aim of reducing burden of disability and need for surgery. Throughout my career I have seen great improvements in cardiovascular care: we have new effective treatments for heart attacks and rhythm problems. And we have many new medications and devices that have been shown improve survival and morbidity in heart failure. However, the latter hasn’t translated into significant improvement in heart failure outcomes. It is still one of the most expensive chronic conditions costing Australia $3bn in healthcare costs alone. The main reasons for this failure to improve outcomes are emergence of new forms of heart failure: heart failure with preserved ejection fraction and heart disease induced by chemotherapy. The former is generally due to obesity, metabolic disease, aging and hypertension - all these are on the rise in our society. Cancer therapies now are more effective than ever, but many are toxic to the heart and blood vessels and can lead to long-term debilitating heart disease that is emerging as a major health problem with a number of cancer patients and survivors on the rise. To see that despite all our advances, we are still not able to help a substantial portion of our patients is pushing me and my team to look for better understanding of these diseases and ways to diagnose and treat them early. I want to improve the poor outcomes for people with heart failure, who still have 50% 5-year survival – similar or worse than most common cancers! Heart failure is not a single disease: there are many contributing factors and causes, ranging from lifestyle factors to genetics, environmental factors and even treatments for other diseases, especially cancer therapies. By studying the specific mechanisms and causes for each type of heart failure we should be able to develop better detection tools and treatment options, leading to earlier diagnosis, more complete recovery, less disability and ultimately improved lives of people in our community. This is the ultimate goal of our research team. Associate Professor Aaron Sverdlov is a cardiologist and clinician-scientist with proven track record in basic through to clinical research. His research interests encompass a broad spectrum of topics related to heart failure. Associate Professor Sverdlov received his medical degree (MBBS) from the University of Adelaide, Australia in 2000. Then he completed his post-graduate training in general medicine and cardiology, including serving as a Chief Medical Resident for 2 years. He was admitted to the Fellowship of the Royal Australasian College of Physicians (FRACP) in December 2007, and then appointed staff specialist in cardiology at the Queen Elizabeth Hospital and Lyell McEwin Hospital from February 2008. He was awarded his PhD in 2012 from University of Adelaide. His doctoral work was on pathogenesis of aortic valve disease: Associate Professor Sverdlov led the aortic valve stenosis group at the Queen Elizabeth Hospital and provided the first evidence in humans that progression of AS is amenable to treatment with renin-angiotensin-aldosterone system inhibitors. He was then awarded NHMRC CJ Martin and RACP Fellowships to undertake postdoctoral work with Prof WS Colucci at Boston University (2012-15). There he studied mechanisms regulating cardiac function and energetics in models of metabolic heart disease/diastolic dysfunction utilizing state-of-the-art techniques and methodologies. He proved that mitochondrial ROS play a key pathogenic role in metabolic heart disease and identified reactive cysteines (never previously described) in mitochondrial complex II that modulate its function and lead to cardiac energetic impairment. Associate Professor Sverdlov's postdoctoral work gained him a reputation as an expert and leader in mitochondrial redox field: he was awarded AHA Postdoctoral Fellowship. Upon return to Australia in 2015, in partnership with his wife, Associate Professor Doan Ngo, he established and co-led Cardiometabolic research group at the Basil Hetzel Institute in Adelaide. There they focused on a variety of cardiovascular areas, including obesity and angiogenesis, weight loss and exercise physiology, novel biomarkers and cardio-oncology. 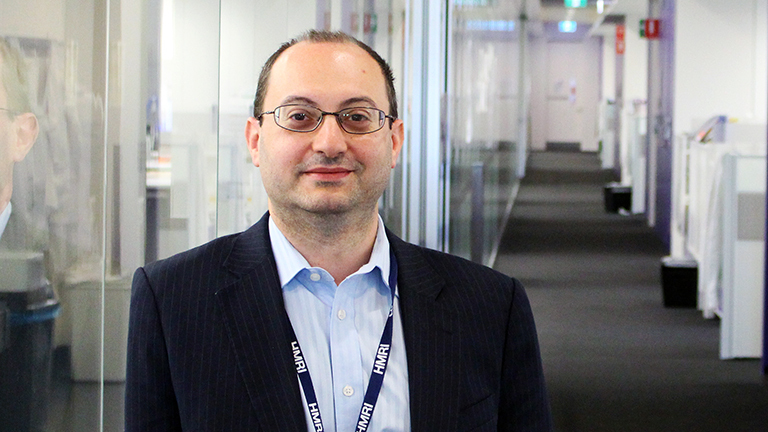 Associate Professor Sverdlov relocated to Newcastle in 2017 where he was appointed as an Associate Professor and Director of Heart Failure at the University of Newcastle. He has a Clinical Academic appointment as a cardiologist at the John Hunter Hospital and is a Clinical Lead of Heart Failure Services for Hunter New England Local Health District. He has just been awarded a highly prestigious Heart Foundation Future Leader Fellowship for his Heart Failure and Cardio-oncology program of research aimed at improving outcomes of our patients. I am committed to improving management and outcomes for patients with heart failure through better understanding of mechanisms involved and discovering novel biomarkers and therapies. My vision is to establish, grow and lead a comprehensive research and clinical program aimed at improving outcomes for patients with heart failure.